Flat, ultra-mobile and a constant companion for an active lifestyle - that's what ThinkPad X models have been designed for. 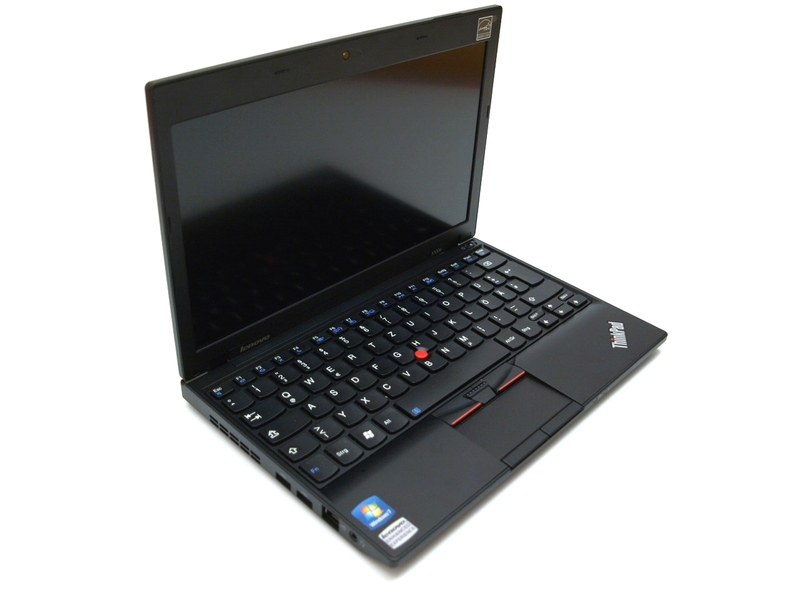 Next to the more expensive and larger X-Series models, Lenovo provides us, according to their statement, with the cheapest ThinkPad that was ever made. However one shouldn’t have too great demands on the 11-inch model. Uncover details in our in-depth review. 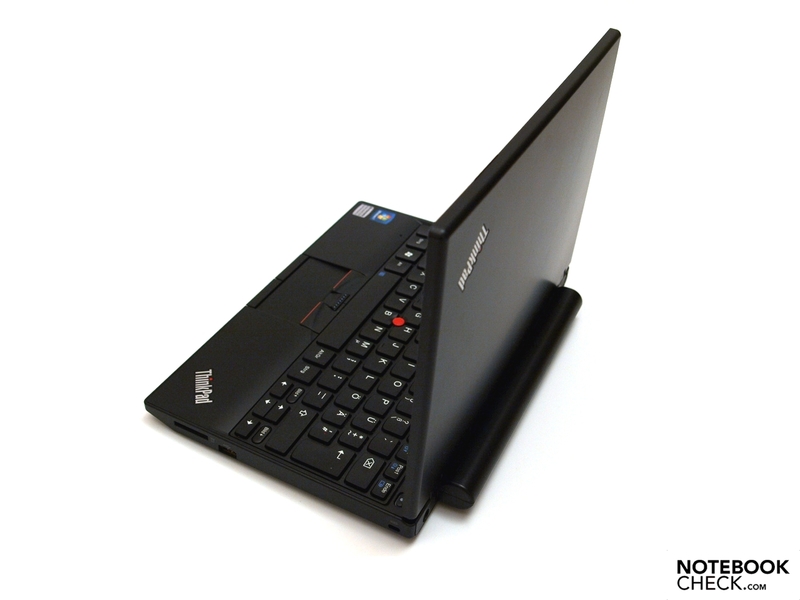 Ultra-mobile with sophisticated communication features that’s how the models of the ThinkPad X series present theirself. 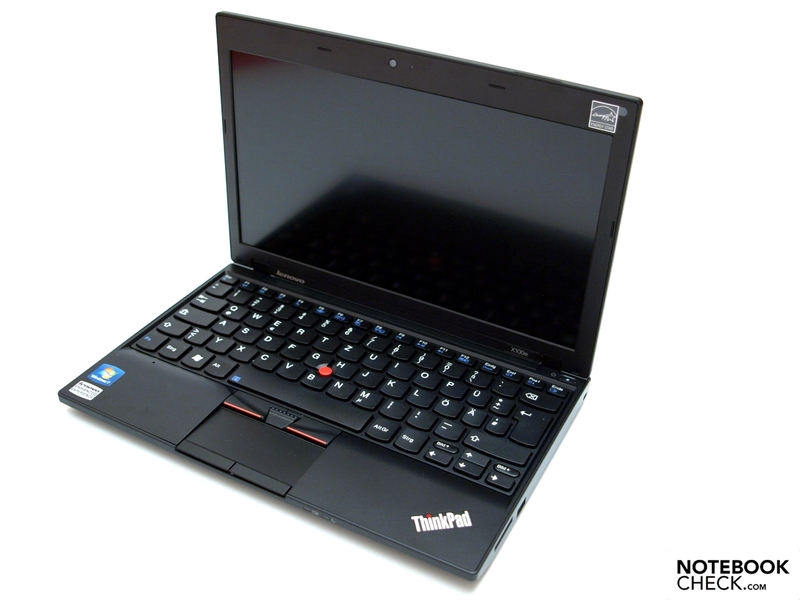 Compared to the much more expensive models, ThinkPad X200s, X200 with 12.1 inches and the X301 with 13.3 inches display and a Core 2 Duo CPUs, the X100e has been significantly economized. It offers only a single core-CPU by AMD and an integrated ATI HD3200 graphic chip. 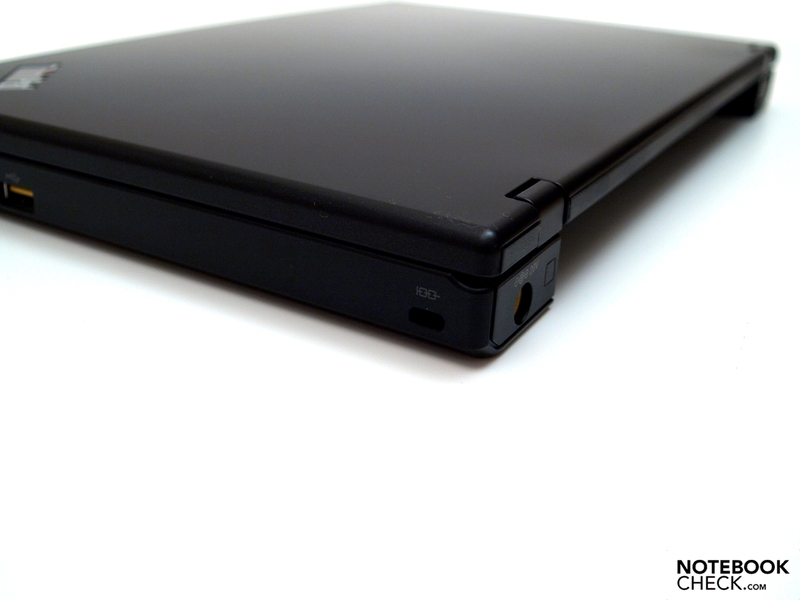 Apart from red elements at the trackpoint and the ThinkPad logo the X100e presents itself completely in matte black. E.g., in the U.S. we get the Thinkpad X100e not only in midnight black, but also in Heatwave Red. With small dimensions of 24 to 30 mm in height, 210 mm depth and 280 millimetres in width and a travel weight of about one and a half kilogramme, plus 340 grams for the power adapter, it can easily be taken everywhere. Despite being made of plastic torsional stiffness and pressure resistance of the base unit and screen are very good. Under pressure, only the screen frame gives way a little. 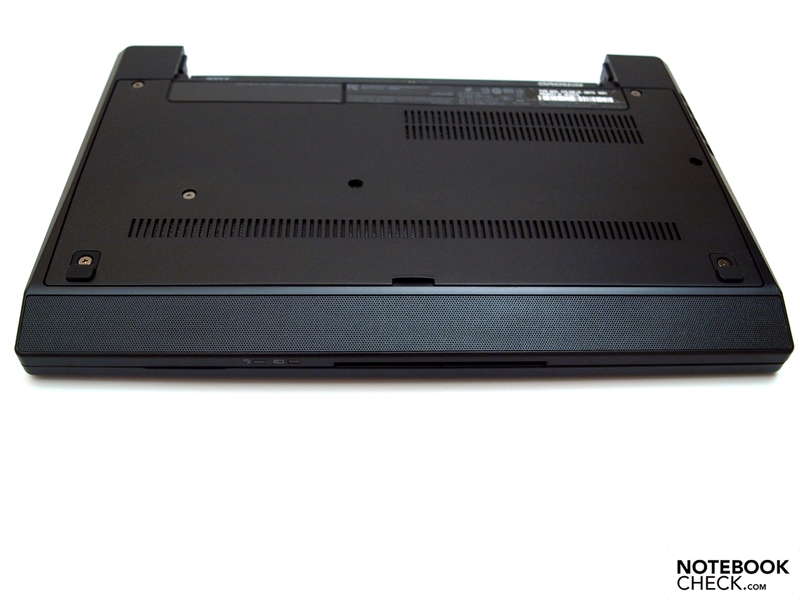 The battery is firmly seated in the case, but after removing leaves a gap above the keyboard. Unfortunately, the display lid is obviously not very scratch resistant, this can be seen even after a short and careful use. The small hinges can not prevent the lid to collapse after adjusting the opening angle. Similarly, the screen vibrates when you work in jerky environment, such as during a train ride. Closing with one hand is easily possible because the hinges are free-moving. However because of the light weight of the base unit, both hands are needed to open or enlarge the opening angle. Lenovo did not built-in a transport lock. 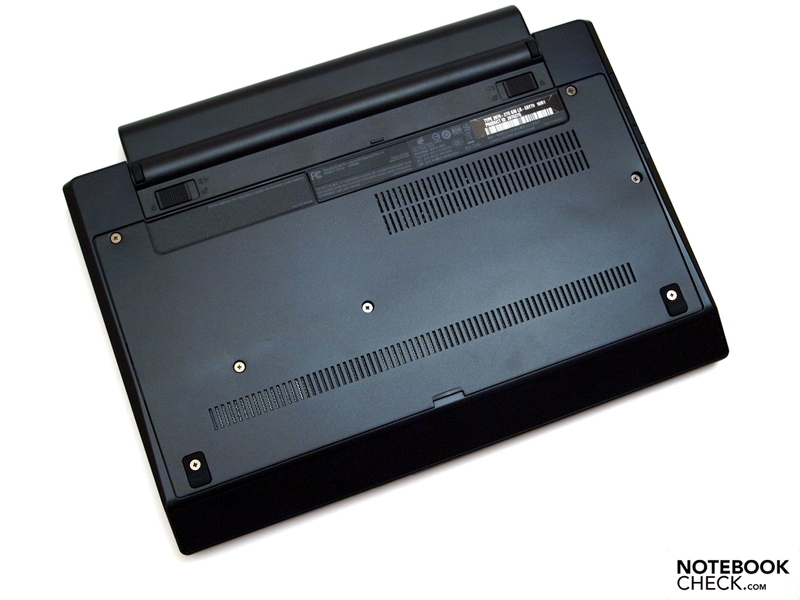 Therefore, when transporting, you should be careful that no foreign objects get between the keyboard and the screen, especially as the tension of the hinges is not sufficient to keep the lid closed while holding the notebook upside down on the base unit. 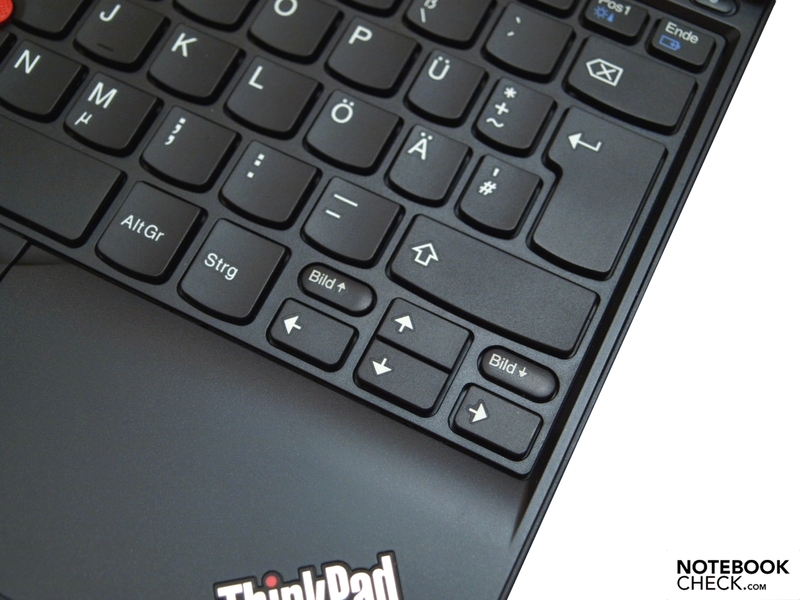 You also have to be careful when opening the laptop: the two touchpad buttons close concise with the display lid and the base unit. As the gap between touchpad buttons and base unit is larger than the one between the display lid and the base, it is very likely to pull up the screen together with the Touchpad buttons. Because of the small form, one shouldn’t expect too rich interface configuration. 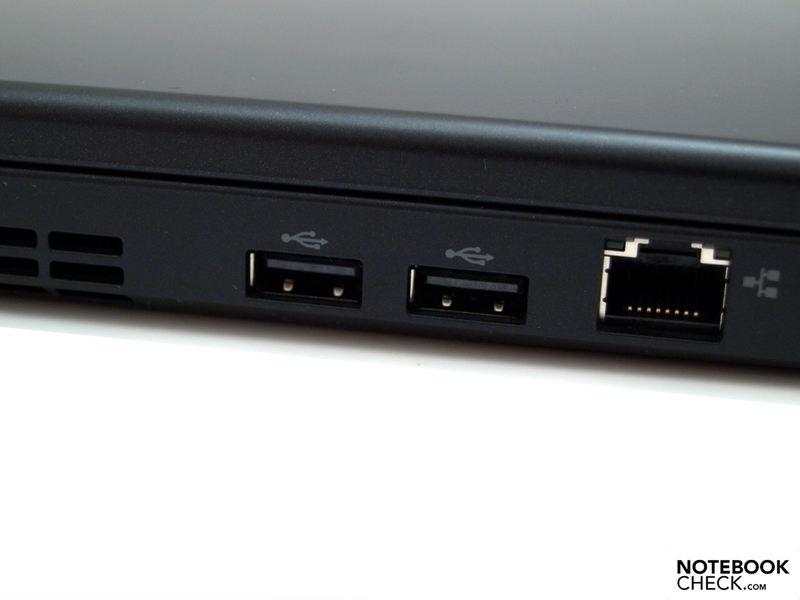 There is a VGA-port for connecting an analogue monitor or projector, a total of 3 USB 2.0-ports, one combined-audio-port for connecting a headset and a 4-in-1 card reader (SD / MMC / MS / MS Pro). Conveniently, the VGA port is on the back. Depending on occupancy, the two USB-ports in the middle of the left side as well as the LAN-port in the front area can lead to disturbing cables, especially for a left-handed person. Also the third USB-port on the right side is rather too near to the front. Although a separate docking port is not present, at least in the U.S., a USB docking solution for the X100e is available. For 149 dollars together with the ThinkPad USB Port Replicator with Digital Video (U.S.) you will get a DVI port, a DVI to VGA dongle, a total of 5-UBS 2.0 ports and one RJ45 LAN port. Communication wise a lot has been integrated. Wireless data can be exchanged via Bluetooth Version 2.1 +EDR with small devices such as PDA or mobile phone. 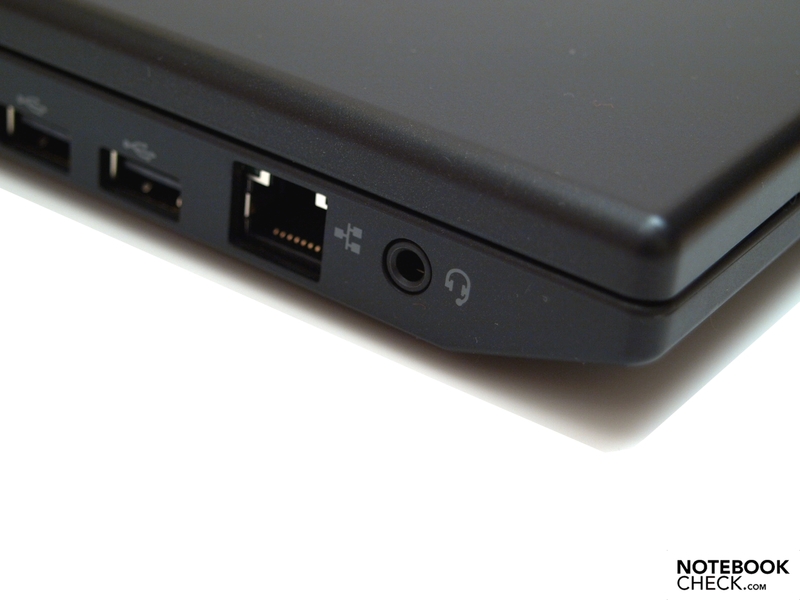 You can connect to networks via Wifi-Hotspot and even use standard n, if supported, by means of the Realtek RTL8191SE Wireless LAN 802.11n PCI-E network adapter. 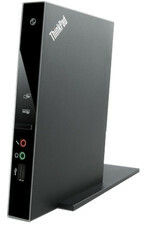 The Qualcomm Gobi 2000 HS-USB Mobile Broadband Device 9205 provides Internet access via broadband modem. The associated SIM card slot is not found in the battery compartment, but beneath the maintenance cover. Finally the Realtek RTL8168D/8111D PCI-EGigabit Ethernet Adapter allows the laptop to connect with Ethernet networks. Video conferences and telephony are possible without further ado with the web cam built into the upper display frame. 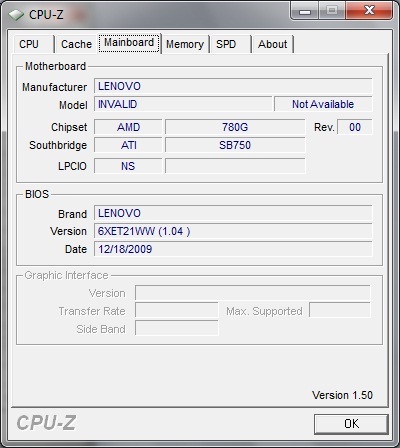 As operating system Windows 7 Professional 32-bit version is preinstalled. This is sufficient in view of the fact just 2 GB are installed. There are practically no accessories in the box - only some poor information on slips of paper. You have to create your recovery disk yourself. But this is easily done with the ThinkVantage tools. In addition to these, you can restore the factory installation as long as the recovery partition is intact. 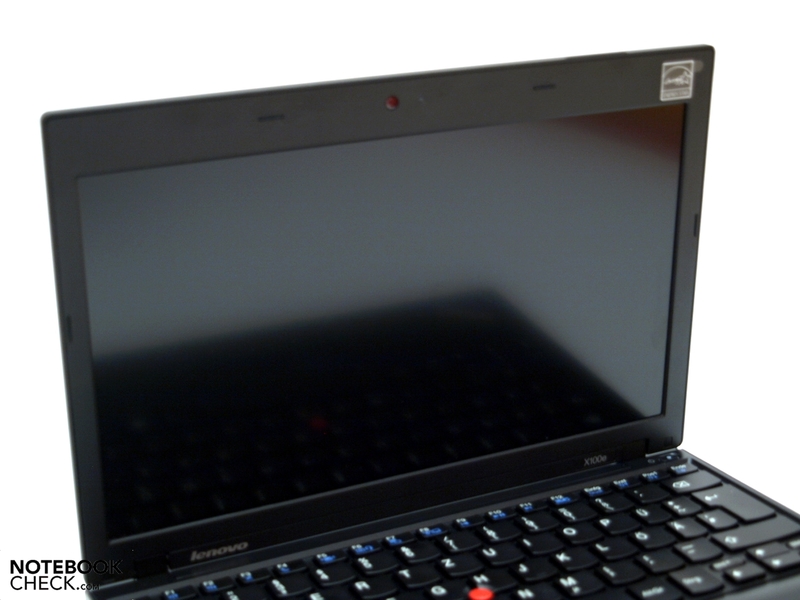 The default warranty for the Lenovo ThinkPad X100e is one year. Considering the price range this is reasonable. 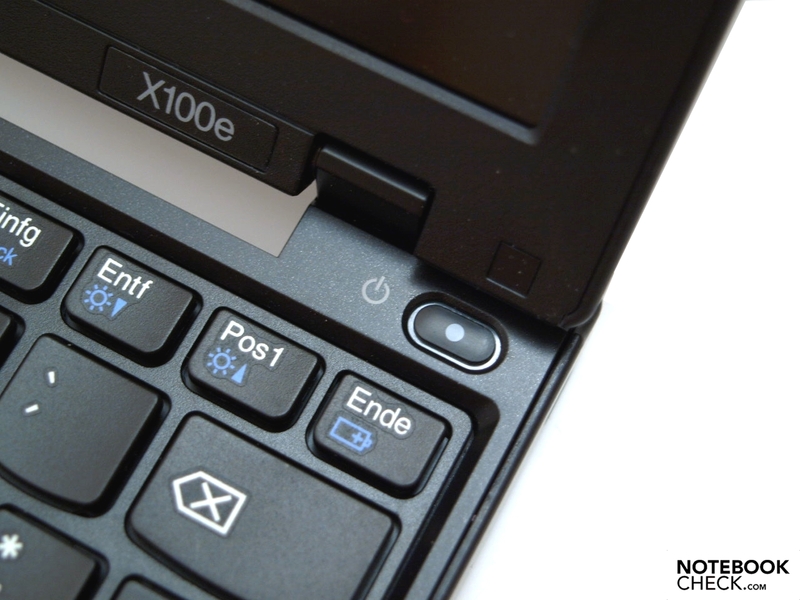 A so-called chiclet keyboard, i.e., single-button design, was installed in the X100e. 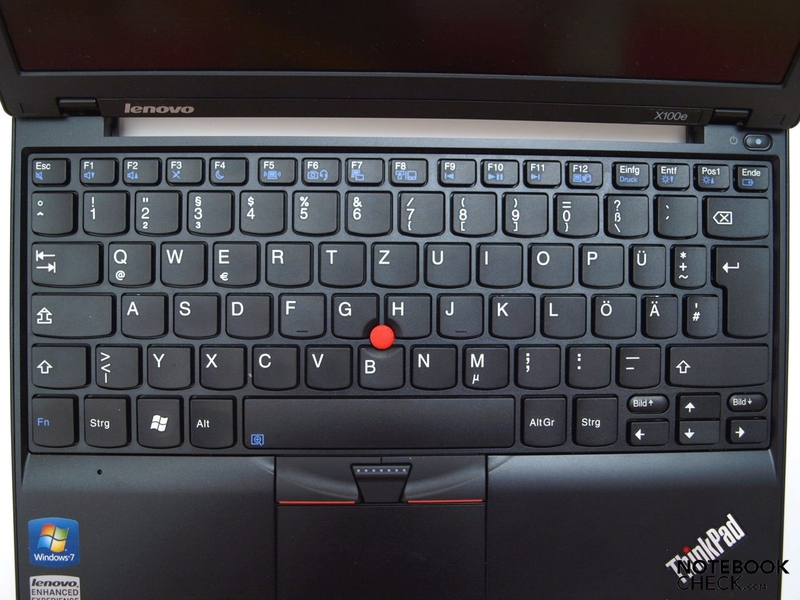 Except for Thinkpad’s typically exchanged Ctrl and Fn key, you can find a standard layout, with which you can start touch typing straight away. This will be facilitated by, for such a mini-laptop, nice large alphanumeric keys of about 15 millimetres in width and 14 millimetres depth, with the front edge rounded out, and a relatively generous distance between the keys of 3 millimetres. The mechanical properties, balanced stroke and clear feedback are satisfying. Moreover, the tapping, also during energetic typing stays pleasantly low. 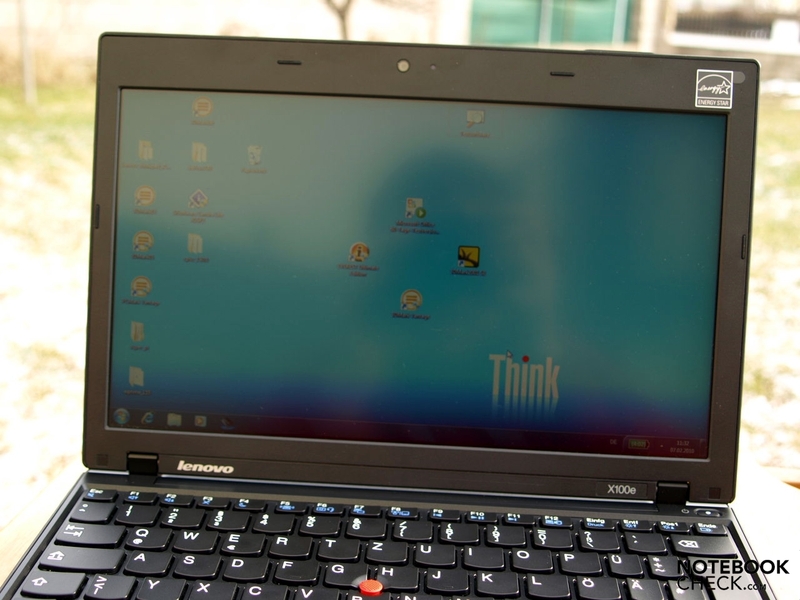 As typical for Thinkpad, again two pointer devices are offered. The relatively small touchpad is about 75 millimetres wide and 34 millimetres deep and lies much deeper than the surrounding case, the edge rises toward the back to about 2 millimetres. So, it can be clearly distinguished from the case. 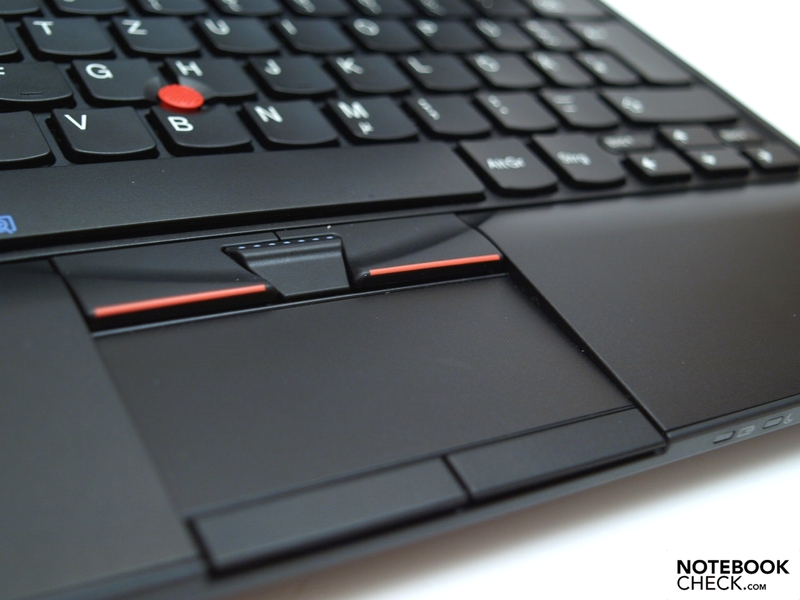 The Touchpad surface feels pleasantly velvety and has good sliding properties. Accuracy and responsiveness are excellent. 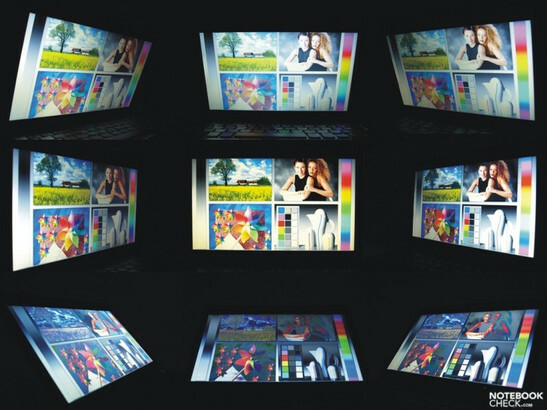 In addition to vertical and horizontal scroll area, the touchpad supports also multi-touch gestures, for example, pinch to zoom and pivot rotation. The accompanying keys are relatively slim, flush with the front edge of the case, have a fairly long stroke length and respond equally on their entire width. In addition, they work relatively quietly. 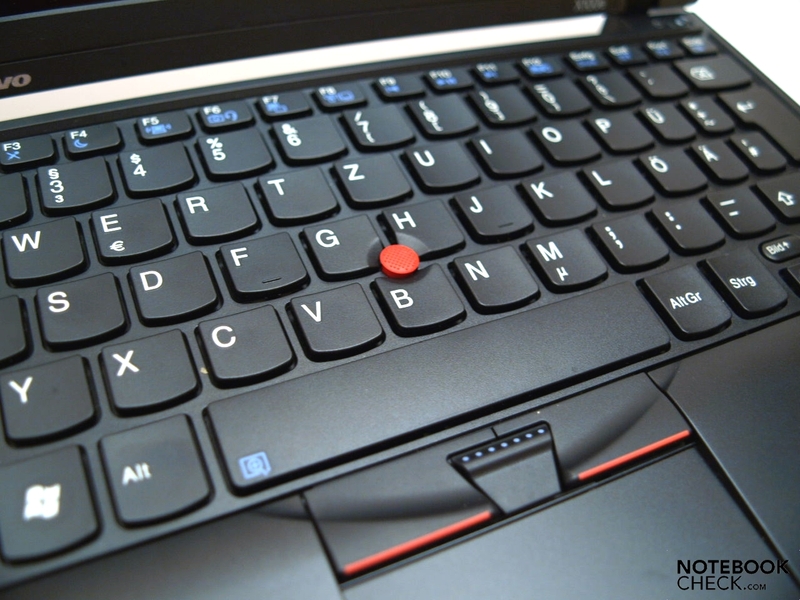 The Thinkpad’s red trackpoint is found between G, H and B. As usual, it works perfectly and after a short time of training you get used to it so that you control the mouse precisely and effortlessly. 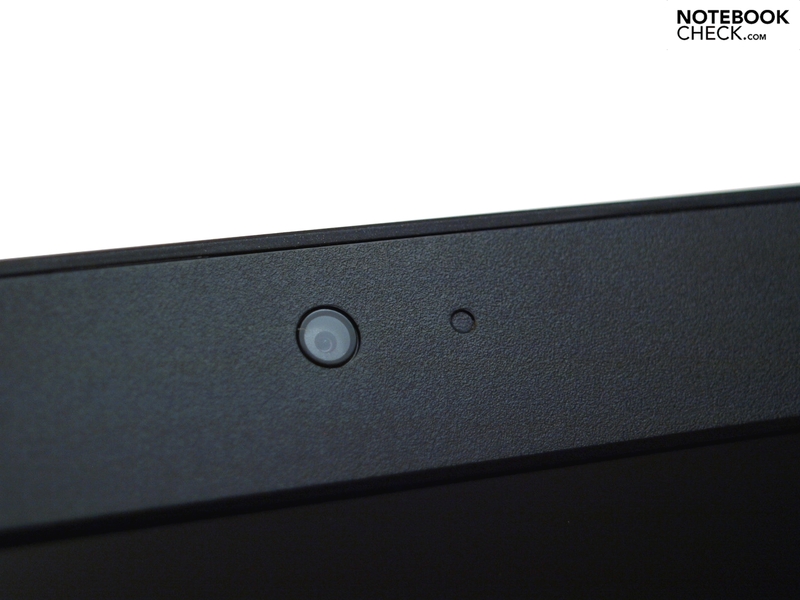 The surrounding buttons have been designed as a tilt buttons, yet they respond evenly on their entire width. 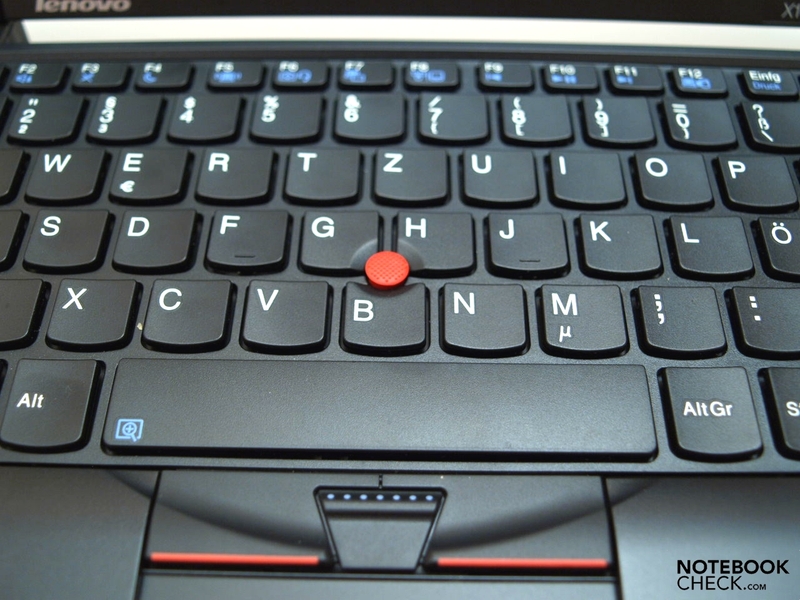 Holding down the center button will allow you to scroll in documents by moving the trackpoint. 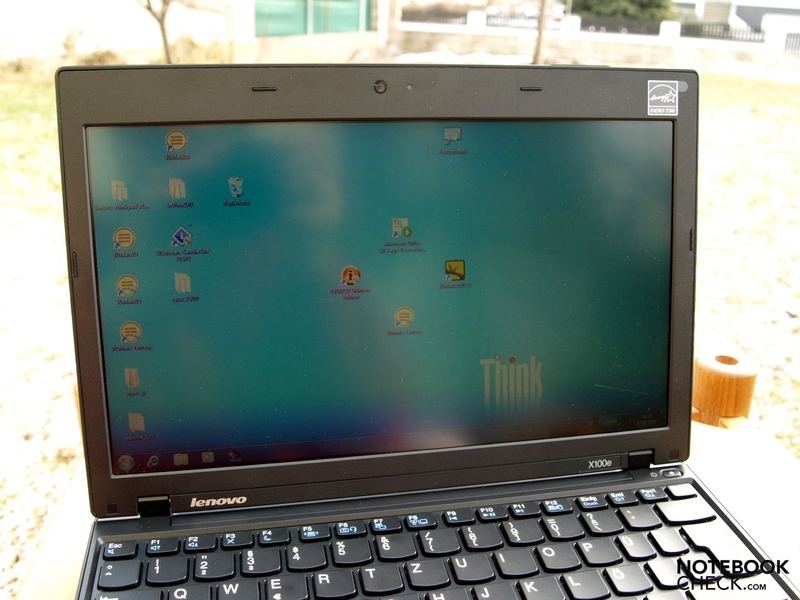 The Thinkpad use a 11.6 inch ( 26 cm x 14 cm) screen with a maximum resolution of 1366x768 pixels. Although the screen provides a cinematic 16:9 format where movies can be played border-free, in vertically oriented applications, such as Internet browser or word processing, etc., you sometimes want a little more height to scroll less frequently. For an 11.6 inch unit the resolution is very fine, so the text with default settings is very small. You can solve the problem either temporary with the screen Magnifier or by increasing the font size permanently. The maximum brightness of 220 cd/m² was measured in the left middle image area. On average, it is 194.4 cd/m². Unfortunately the brightness in some areas was significantly lower, and the minimum brightness for "white" of 167.2 cd/m² was measured for the upper middle segment. From the two extremely different results arise a slightly inhomogeneous illumination of 76%. Still, you won't be able to see any shadows or smears in solid coloured backgrounds with naked eye. Because of the relatively high black values, this is the brightness of "black" measured center of the screen, of about 1:51 cd/m², the contrast ratio of 144:1 turns out to be comparatively low. Subjectively, the colour representation is quite good and the image sharp. Fortunately, the screen has a matte surface. Although one can perceive some diffused reflections when the screen is off, but they do not disturb once the display is turned on. An outdoor usage causes no trouble, at least in the shadow. In direct sunlight though, one would wish, a little more brightness. The viewing angle stability is notebook-typical. Horizontally one can enjoy a generous viewing angle, while vertically, image changes quickly occur in the form of outshining when viewed from above or darkening when viewed from below. 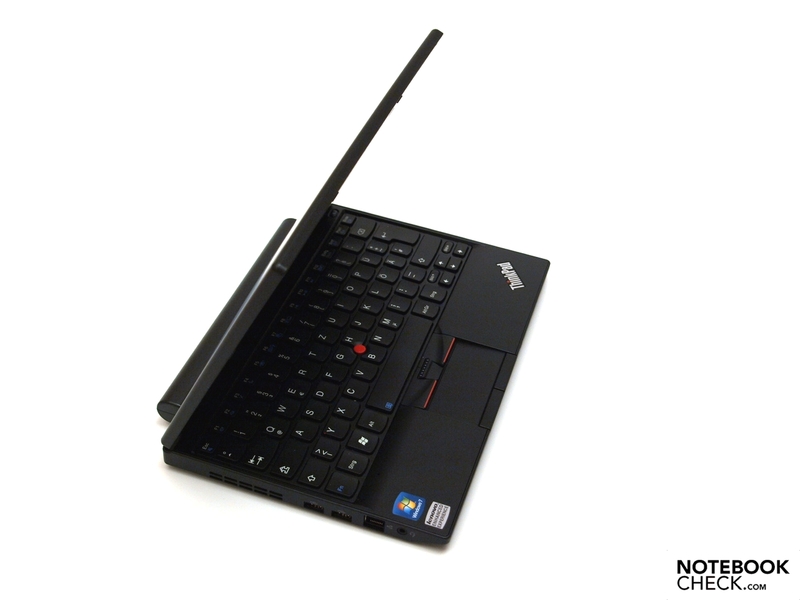 One thing first: you can’t expect an outstanding application or even graphics performance from the ThinkPad X-Dwarf. 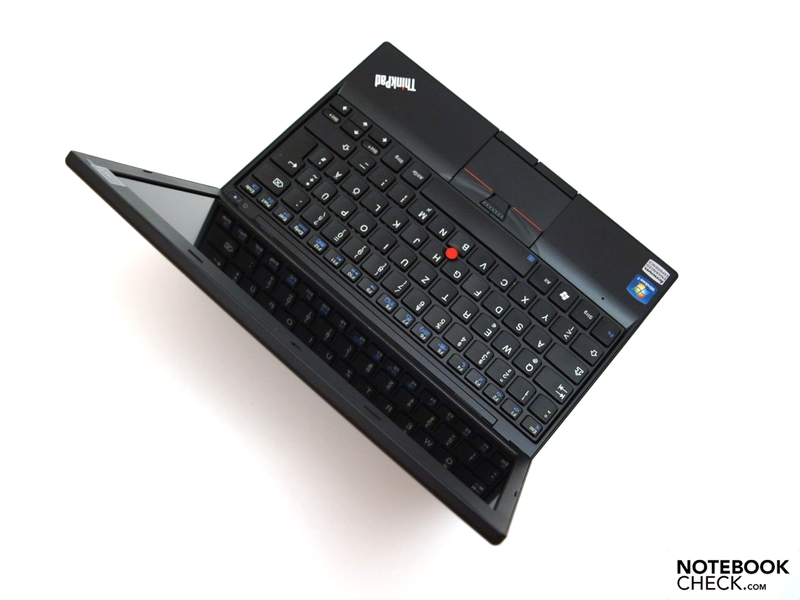 More or less the performance of typical Atom netbooks can be surpassed. 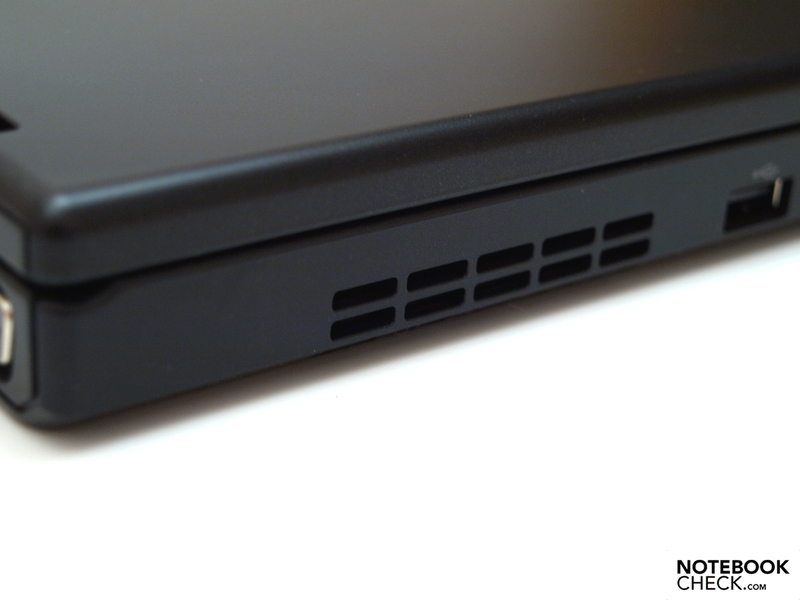 First we will have a look at the insides of the Thinkpad X100e-s. 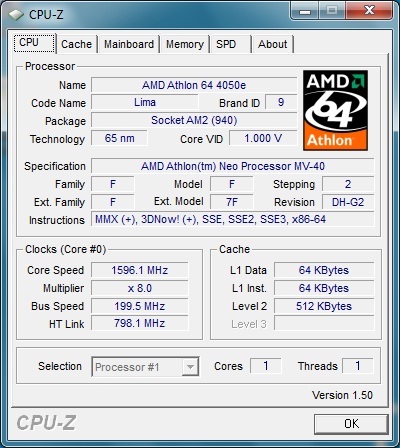 The computing heart is an Athlon Neo MV40 processor from AMD. This single-core CPU is designed for small slim notebooks and is characterized less by performance than by great energy efficiency. The thermal design power (TDP) of 15 watts, compared with Intel's Atom CPUs which use depending on the model 2 to 8 watts of energy from the socket is relatively high. Other features of this processor developed under the code name "Huron" in 65 nm lithography are a processor clock speed of 1.6 GHz and 512KB Level-2 cache. The ATI Radeon HD 3200 integrated in the AMD M780G chip set is responsible for pixel calculations. The Radeon HD 3200, contains 181 million transistors and with its own dedicated video decoder called UVD helps the CPU in the computation of high-definition video material. 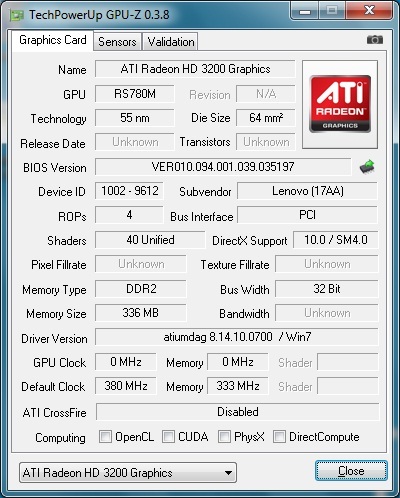 Beside that, the in 55 nm technology produced Radeon HD 3200, masters DirectX 10 compatible Shader Model 4.0. It doesn’t have its own memory, but, instead borrows it from the RAM. 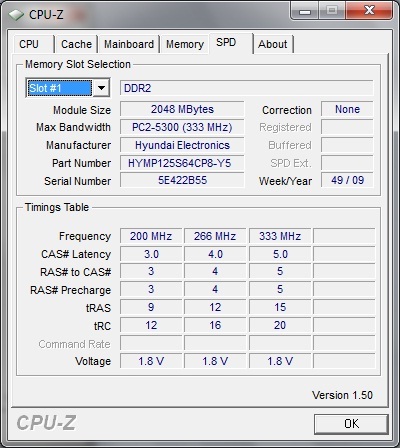 The clock speed comes up to 500 MHz, however Lenovo, reduced it to only 380 MHz (core) and 333MHz (memory) in the X100e. 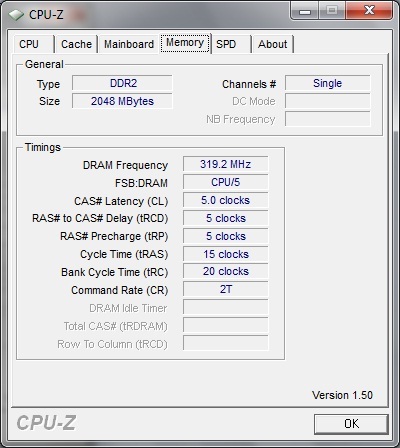 Two gigabytes of PC2-5300 (333MHz) DDR2 RAM in a single module are built-in. 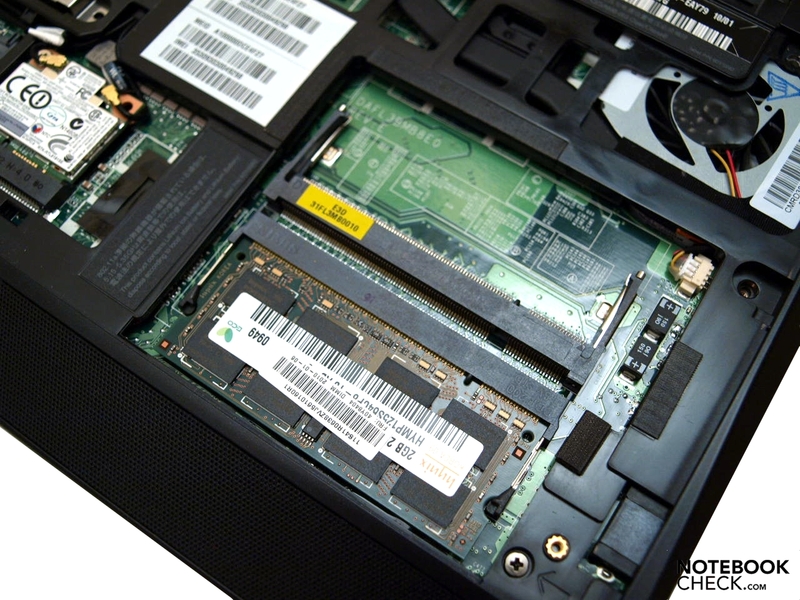 The M780G chipset is compatible up to maximum of 8 gigabytes of RAM. 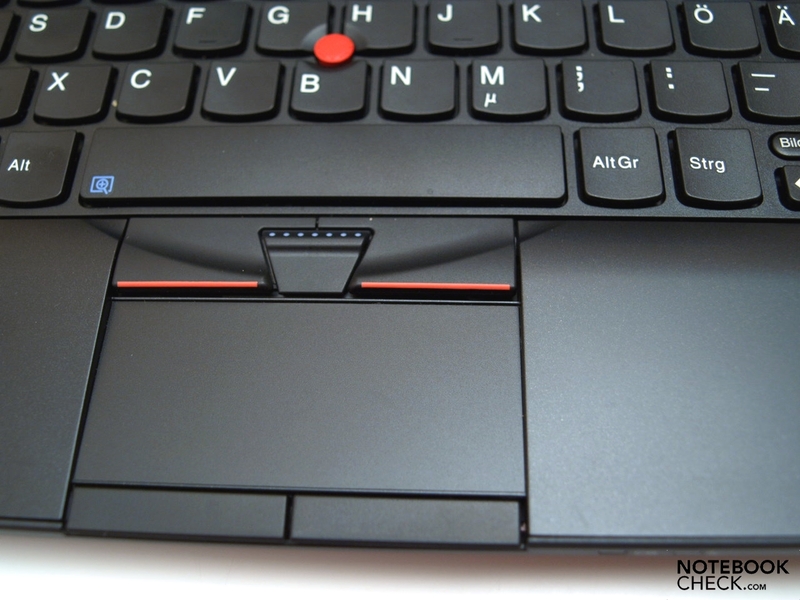 After removing the maintenance cover, you can also easily upgrade the Thinkpad X100e yourself if needed. 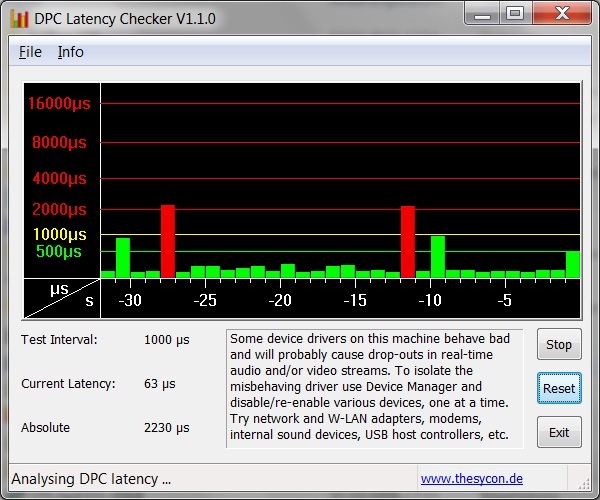 To eliminate any problems with the synchronization of external devices, we have determined the DPC latency with the DPC Latency Checker. Unfortunately, there are always outliers in the red range. By selectively disabling the drivers a possible cause can be found and the problem could be solved by a driver update. 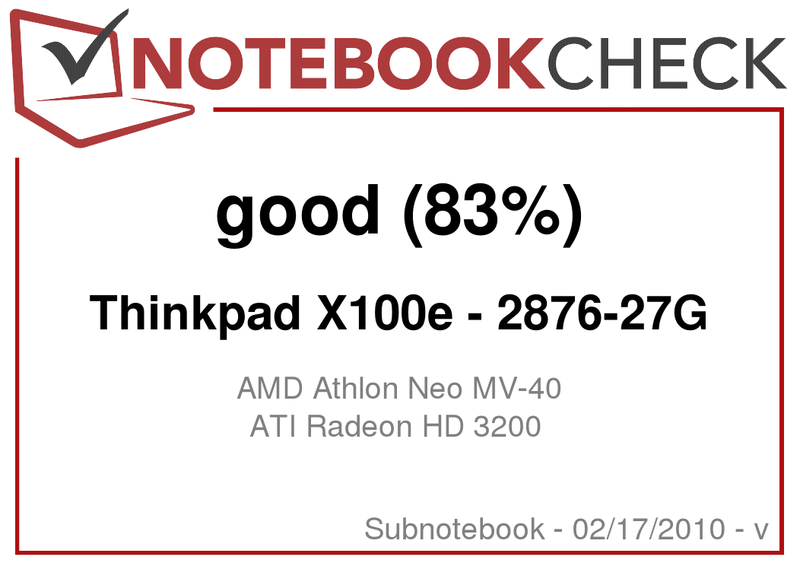 In the CPU-oriented benchmarks, the Athlon Neo MV-40 can leave its Atom competition from Intel in some cases significantly behind. The Thinkpad X100e reaches about 5800 MIPS in Dhrystone and 4908 MFLOPS in the Whetstone benchmark. 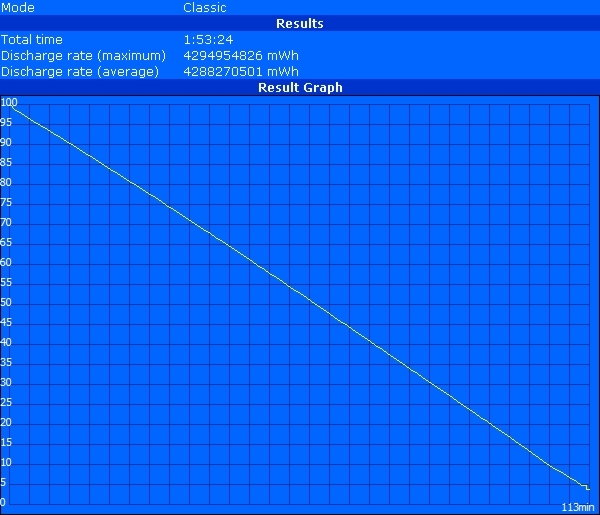 It finishes WPrime 32m in about 100 seconds, 1024m in about 3200 seconds. For the calculation of 32 Million digits of the number PI using the program SuperPi the CPU requires about 50 minutes, for 2 million approximately 2 minutes and finally for one million a minute. In Cinebench Single Rendering it’s up to 1274 points. 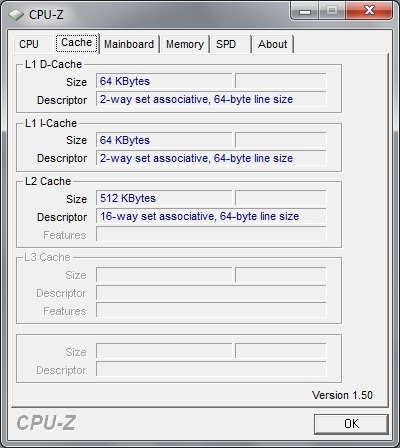 The PCMarkVantage test allows evaluation of application performance. The X100e scored a total of 1387 points. Overall the application performance is therefore not considered outstanding, but sufficient for the normal working day. In the graphics-benchmarks the down-clocked Radeon HD 3200 scored slightly better than Intel's GMA 4500M HD. Anyway, the 3D performance is not outstanding. Modern 3D-advanced computer games are playable at best with low details. But the mini-laptop was not designed for that. For further information about video performance, please go to our games list, and our benchmark list of mobile video cards. 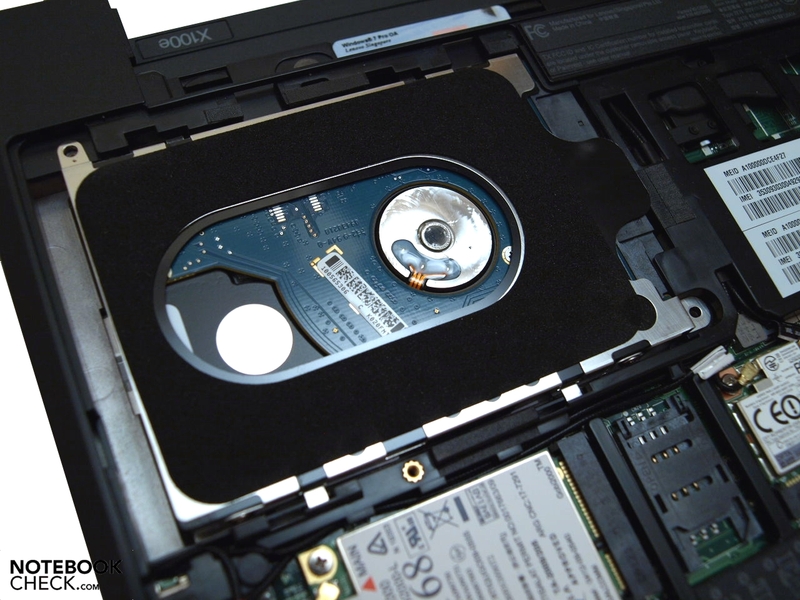 The tested ThinkPad X100e has a ST9250315AS ATA hard drive from Seagate installed. The Momentus 5400.6 hard drive uses the SATA II interface, offers 250GB of gross capacity and works with a rotational speed of 5400 revolutions per minute. But, just about 220 GB are available to the user. 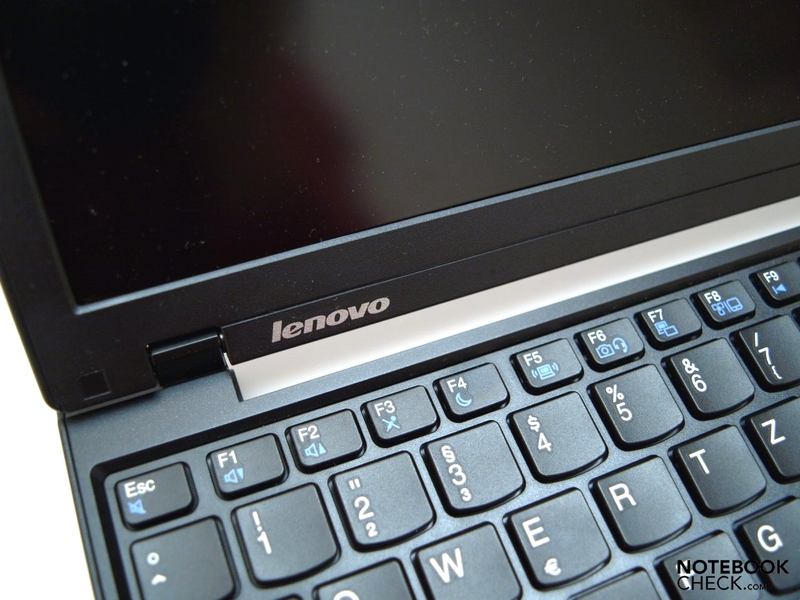 About 10GB are used for example for the Lenovo_Recovery partition. 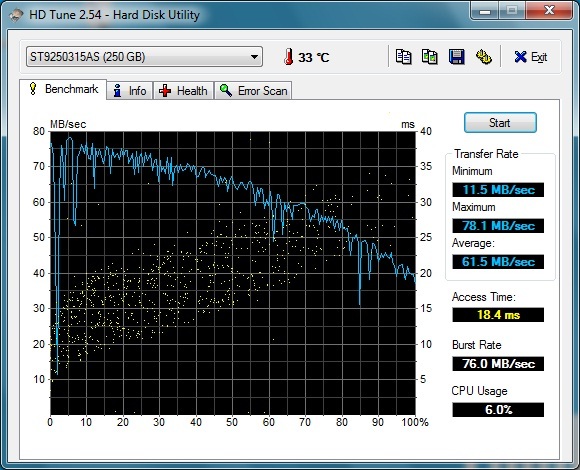 The values recorded by HDTune benchmark are consistently within a normal range. An alternative offer, at least in the U.S., is a 320 GB hard drive, also with 5400 rpm rotational speed. 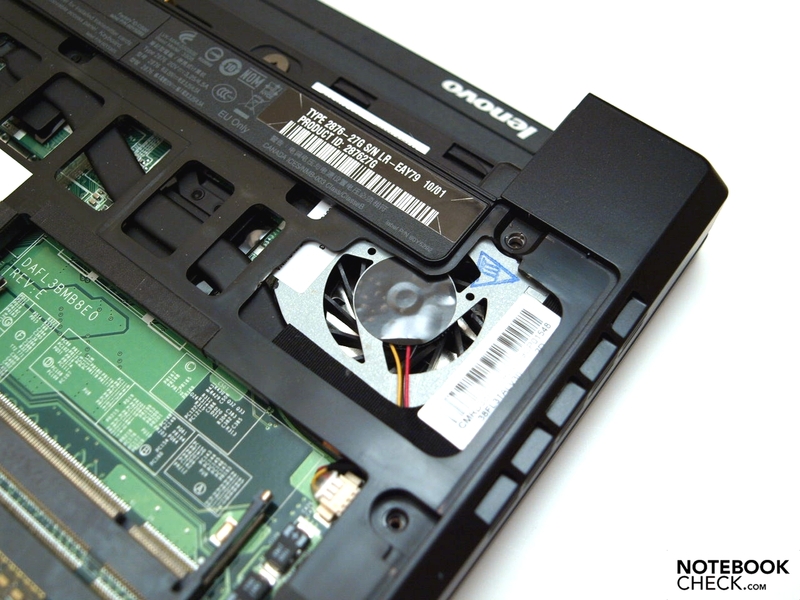 If necessary, the user can also easily replace the drive on his own via the maintenance cover. The noise during the test was always in reasonable limits. With a maximum of 33.7 dB(A) the X100e is rather one of the quiet models. Apparently a higher temperature development was taken into account for the benefit of its fairly low noise levels. While placed under a lot of strain, we can even measure a peak of 61.1 degrees Celsius at the left front area of the base. But also wrist-rest, touchpad and keyboard reach around 40 degrees Celsius. Fortunately, full-power operation should be the exception. When operating under low load, the upper side stays pleasantly cool. But even then, on the bottom below the touchpad the 40-degree mark is reached. Nevertheless it should be possible to work with the X100e on your thighs, as this area will rather not rest on the thighs and in other areas body temperature is not exceeded. (-) The average temperature for the upper side under maximal load is 40.9 °C / 106 F, compared to the average of 30.7 °C / 87 F for the devices in the class Subnotebook. (±) The maximum temperature on the upper side is 42.1 °C / 108 F, compared to the average of 35.8 °C / 96 F, ranging from 22 to 57 °C for the class Subnotebook. (-) The palmrests and touchpad can get very hot to the touch with a maximum of 41.9 °C / 107.4 F.
(-) The average temperature of the palmrest area of similar devices was 28.6 °C / 83.5 F (-13.3 °C / -23.9 F). The speakers are located along the downward bevelled leading edge, directing the sound more to the table as to the user. For such a mini-notebook the sound quality is surprisingly good and balanced, though not surprisingly for a system without a subwoofer, not particularly intense in basses. As expected the X100e can definitely not keep up with external sound systems. More volume and bass can be achieved by connecting high quality headphones to the 3.5 mm combo audio jack port. This one remains in the test without any abnormalities. The review candidate has a 6-cell battery with 57 Wh capacity (10.8 V, 5.2 Ah), which is found at the rear of the enclosure. With that, the X100e achieved a usable battery life for a small mobile unit, although it cannot compete with the top models. 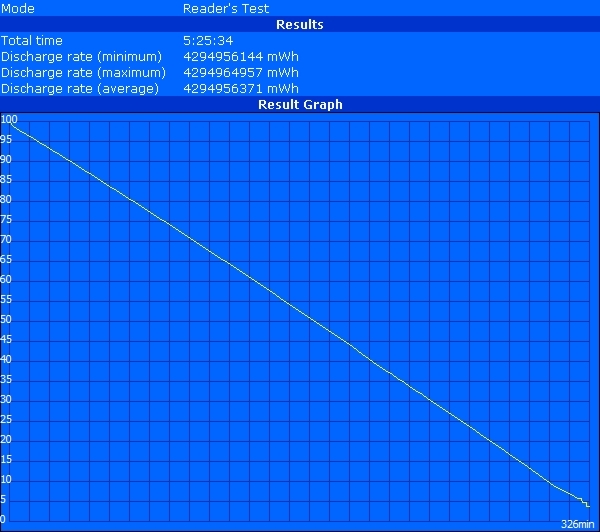 The Reader's Test of the BatteryEater tool recorded a maximum of 326 minutes (slightly less than five and a half hours) at minimum brightness, turned off wireless and "energy saving" profile. However, at minimum brightness nearly nothing can be seen effortlessly. The minimum, recorded by the classic test of the same tool, is only 113 minutes, nearly two hours of off-line operating at maximum brightness, with switched on wireless and with high performance profile. In our reality oriented WLAN test, we were able to research approximately 275 minutes, slightly more than four and a half hours on battery power at 13/15 brightness level in the Internet and watch youtube videos. In comparison, its battery life is approximately on level as the one of the Latitude Precision E4300, a 13.3 inch laptop from Dell with an Intel Core 2 Duo SP9400, Intel Graphics Media Accelerator (GMA) 4500MHD and 56 Wh battery, which reached a maximum of 397, a minimum of 88 and 290 minutes in the WLAN test. Devices that are equipped with significantly weaker Intel Atom CPU and GMA 900/950 graphics chip have obviously an advantage in terms of battery life. Considering the hardware, the power consumption meets our expectations. The laptop requires a power of maximum 35.4 watts. Under low load it is a minimum of 9.8 watts. Also the values in standby and turned off mode are satisfying. 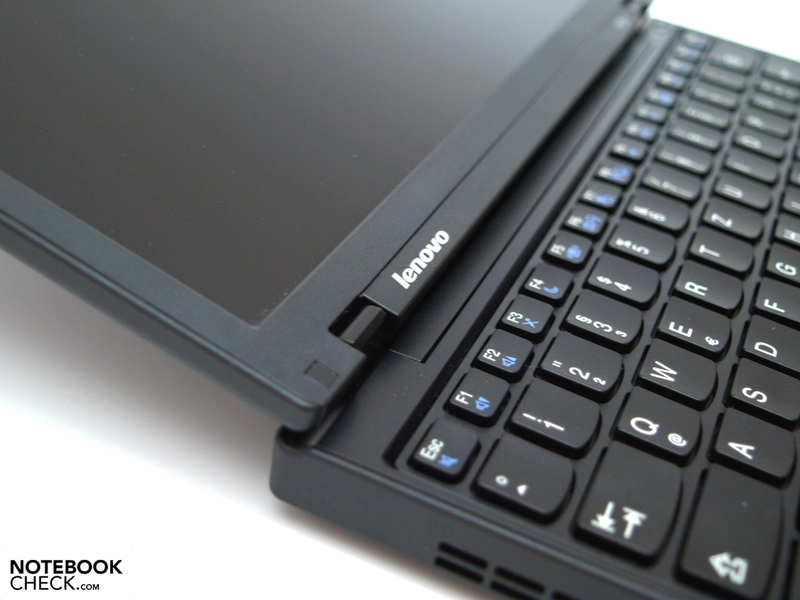 Lenovo successfully created and released an inexpensive, small notebook for business use, with decent application and graphics performance. We especially liked the extensive communication facilities, which also include a broadband modem. Because of its matte, reasonably bright screen you can even take care of business communication on the move, at least as long as the sun does not fall directly onto the screen. The battery life is alright for that. But a full working day away from a power socket is not possible. 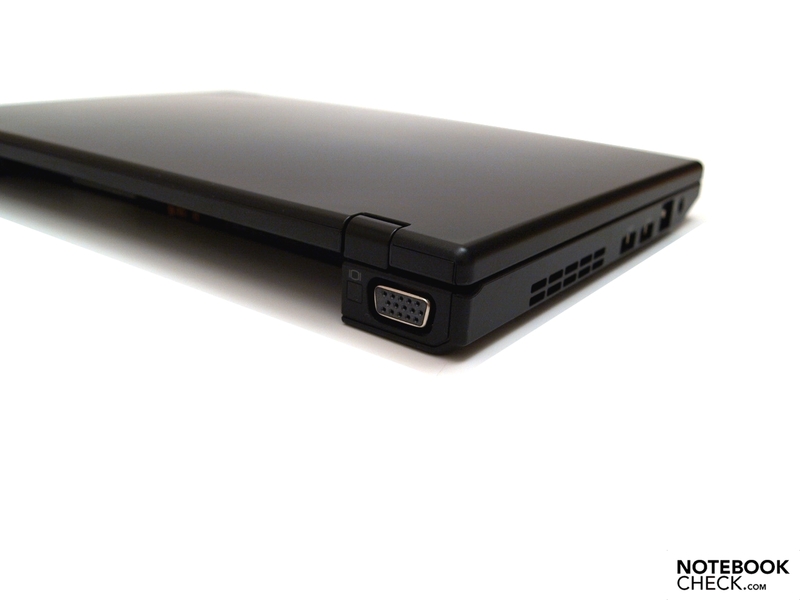 You have to do without an integrated optical drive, just as with most mini-laptops. 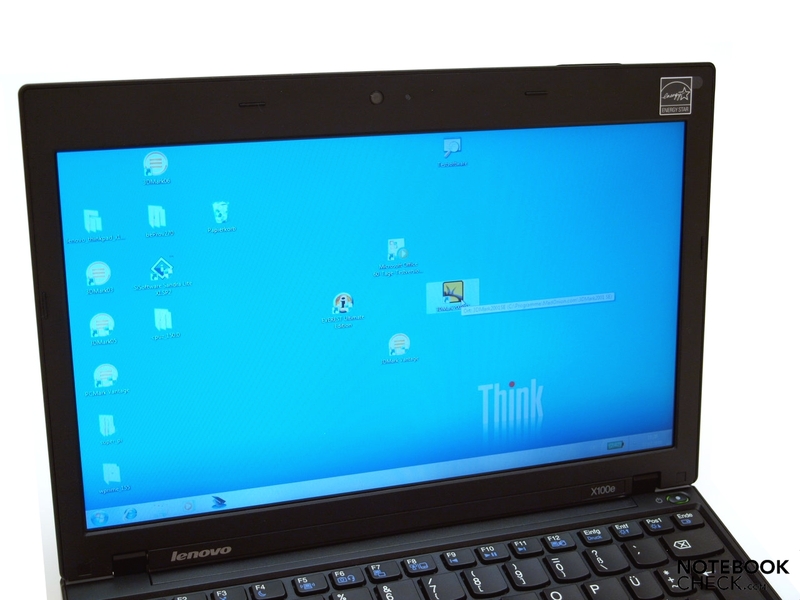 Lenovo saved on the docking port, a must-have for business equipment, but you can still use an USB docking solution. At least the VGA port is situated on the back. Left-handers will not be pleased, depending on occupancy, about the LAN port at the front of the left side. Similarly the positioning of USB interfaces is in particular for left-handers, not the best. 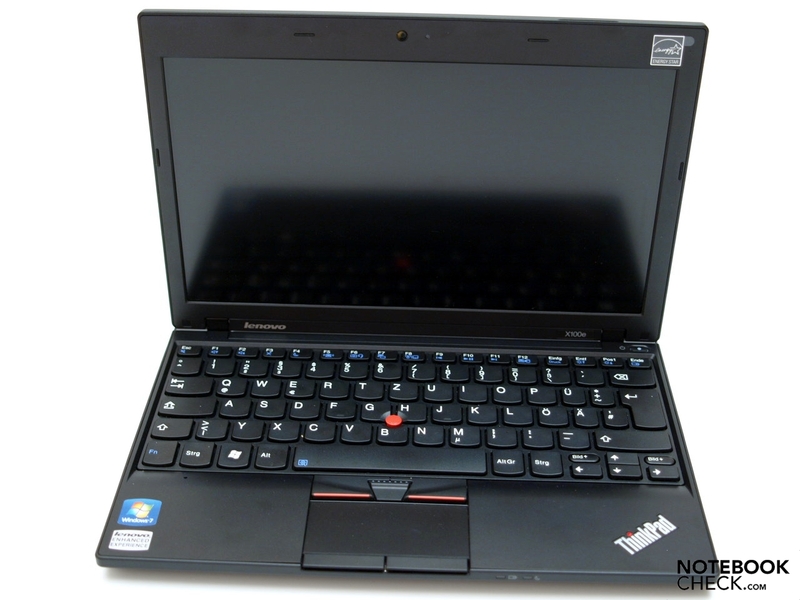 Whoever looks for an 11 inch model for mobile working, consumers as well as business customers, can take the Lenovo ThinkPad X100e in consideration. 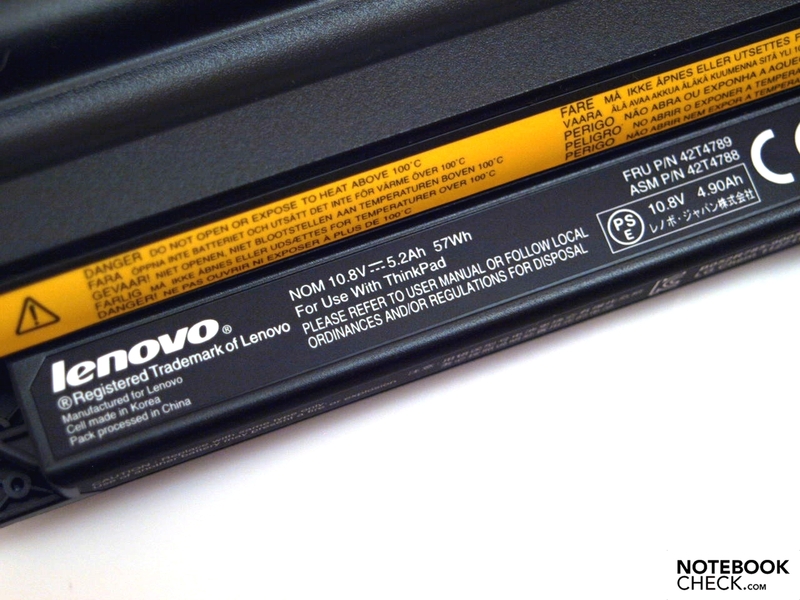 It is more expensive than current netbooks, but, you will get more computing power at the expense of battery life. 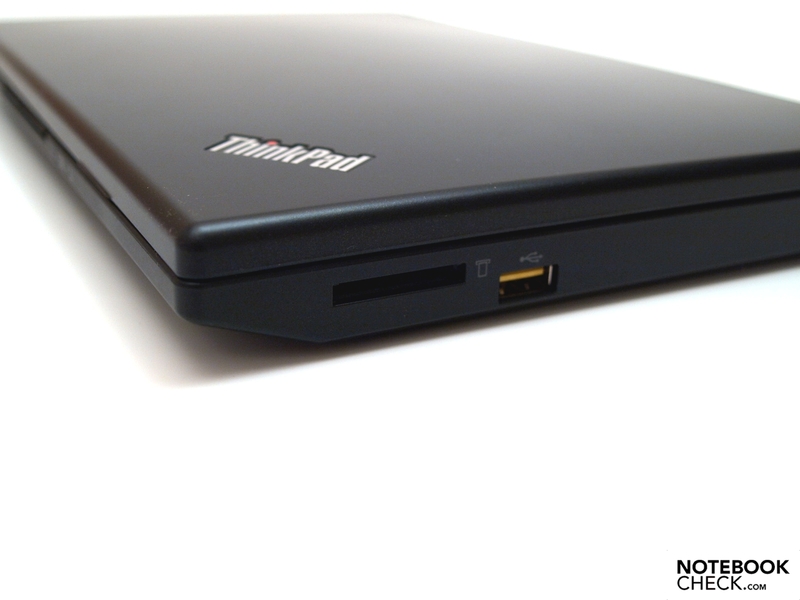 An autonomous docking port is a must-have in a business notebooks. 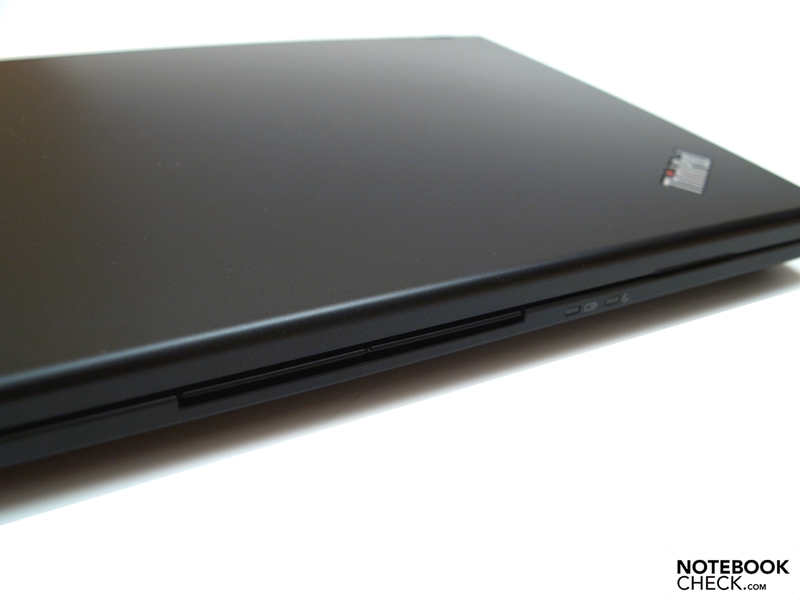 11.6 inch model with similar hardware equipment can be found for example as the Fujitsu LifeBook P3010 with lower resolution, or the Acer Ferrari One 200 with a stronger processor, but glossy screen.